Home »Posts Tagged "App Store"
Tricky $999.99 is the price tag for 4 of the priciest iPhone Apps on Apple’s App Store. But don’t you wonder why would someone pay so much for an app? See 12 more apps at a lower price, yet of premium value and discover what’s the “royal jelly” inside. Smartphone Apps or mobile apps marketing trend is converging among the avid personnels. If you want your app to be recognized by the whole world, then there are some crucial points to be kept in mind while developing and designing. Because in this competitive world of app development and marketing, there are millions of apps in the market. Thus, marketing for your app perfectly by targeting the exact niche becomes vital. App Store becomes already five and and this graphic comes to resume how the two smartphone app giants perform in popularity for paid and free apps and revenue. 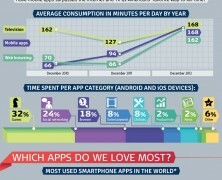 Following to the statistic part you will find 8 key factors that make an app great. This infographic pinpoints 7 “commandments” of mobile app marketing by using the classic good vs evil approach to help you better understand the dos and don’ts steps. It provides a visual process of app promotion phases from reaching the right audience to continuous marketing efforts that will crown your app. This infographic examines the clash between the two tech giants from developers’ side. The big question is, Android or iOS platform brings in the most bucks? About 6 years ago, that mobile app industry was hardly in its infancy, just a handful of tech savvies could foresee the spurt that was bound to come. Now that we’ve felt the heat, projections about the future off mobile app economy are of the most promising.